Tiny robots created out of DNA may be the next big thing in cancer treatment. Wyss Institute scientists have developed a drug-delivering nanorobot that looks like an open-ended barrel (above). The exterior surface of the device is programmed to recognize a target on a cell surface; the drug payload (purple) is secured with anchor strands (yellow) to the interior. Double-stranded DNA latches (blue, red, and orange) ensure that the robot unlocks only in the presence of a molecular key expressed by the target cells. That opens the device (below right), enabling the payload to attack only the designated cells. In the not-so-distant future, a new kind of robot, one of the tiniest ever made, may have the ability to track down and destroy cancer cells. Films like Fantastic Voyage (1966) and Innerspace (1987) have long conjured fictional images of microscopic submarines or machinery that can travel inside the human body to cure ailments. Now Shawn Douglas, a research fellow at Harvard’s Wyss Institute for Biologically Inspired Engineering, is working on making that a reality. 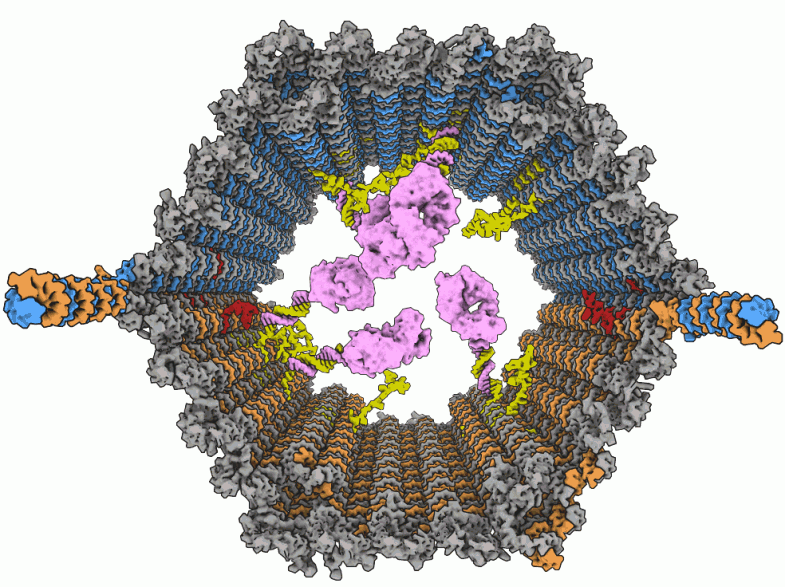 In a recent issue of the journal Science, Douglas described a method for creating tiny machines—roughly the size of a virus—out of strands of protein and DNA. Wyss Institute scientists have developed a drug-delivering nanorobot that looks like an open-ended barrel (below left). The exterior surface of the device is programmed to recognize a target on a cell surface; the drug payload (purple) is secured with anchor strands (yellow) to the interior. Double-stranded DNA latches (blue, red, and orange) ensure that the robot unlocks only in the presence of a molecular key expressed by the target cells. That opens the device (above), enabling the payload to attack only the designated cells. To construct his devices, Douglas calls on these tools and a technique informally known as “DNA origami,” first developed by Caltech researcher Paul Rothemund in 2006. The process begins with a single long strand of DNA that Douglas uses as a backbone or “scaffold” for a structure. That strand is mixed with short chunks of custom-built DNA he calls “staples,” which are designed to bind to specific sections of the scaffold, bending and twisting it into pre-determined shapes. Each of Douglas’s nanorobots measures only 45 nanometers long by 35 nanometers wide—minuscule compared to the 75,000-nanometer width of an average human hair. The advantage of a machine this small, he says, is that it can directly interact with the surface of individual cells. At the moment, he is designing DNA aptimers that unravel in the presence of platelet-derived growth factor (PDGF), a protein that regulates cell growth and division. In cancerous cells, PDGF is over-expressed on the outer cell membrane, providing what is essentially a chemical beacon for his nanorobots. Douglas hopes that by targeting specific cells in this way, his devices can help treat diseases like cancer without the need for traditional chemotherapy, which releases toxic agents throughout the body. “Those drugs might shut down cancer cells,” he says, “but they also shut down all sorts of good processes that we want to keep going,” leading to hair loss, nausea, and other side effects. His nanorobots, by contrast, could deliver medication directly to cancerous tumors, cutting down on the doses needed to reprogram or destroy rogue cells by delivering only tiny amounts directly to those cells themselves. He is currently attempting to use nanorobots to attach antibodies to the surface of cancer cells, a process that could give the body’s immune system a way to identify and destroy those cells on its own. Initial experiments done in vitro look promising, and he hopes to accelerate production of the devices in order to use them for studies with lab animals within the next few years. This video, presented courtesy of the Wyss Institute, explains how nanorobots work. 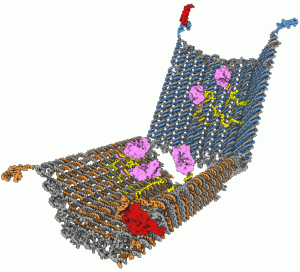 DNA nanorobot from Wyss Institute on Vimeo. Article originally written for Harvard Magazine. Published September 2012.